Ubiquiti RD-5G30-LW. 5GHz Rocket Dish, 30dBi with rocket kit. Pair a RocketDish™ antenna with a Rocket™ basestation to create the endpoint of a high-performance, Point-to-Point (PtP) bridge or network backhaul (Rocket sold separately). The RocketDish is available in the following frequency models: 2.4 GHz, 3 GHz and 5 GHz. 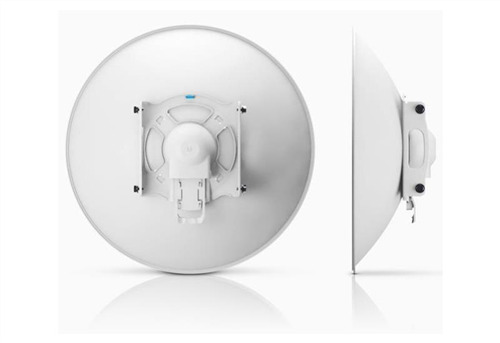 The RocketDish antenna delivers 2x2, dual-polarity performance. On the right is one example of how the RocketDish with Rocket can be deployed in a backhaul link to deliver bandwidth from an ISP network out to a neighborhood tower. From there, an airMAX® Sector with Rocket delivers bandwidth to the ISP’s customers. Cross Polarisation : 35 dB Min.